This event is part of the Institute for International Economic Policy’s Adaptation to Climate Change Initiative. 7:30 a.m. – 1:15 p.m.
1. WHAT IS YOUR PERSPECTIVE ON THE PUBLIC ROLE IN THE ENERGY SECTOR, IN SEEKING ECONOMIC AND CLIMATE BALANCE? 2. HOW DO YOU ENVISION THE WAY THE PUBLIC SECTOR WILL INTERACT WITH THE PRIVATE SECTOR? 2. WHAT ARE THE MAIN CONSTRAINTS ON IMPLEMENTING THE APPROPRIATE PUBLIC ROLE? 3. 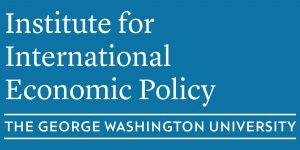 WHAT DO YOU VIEW AS UNIQUE TO YOUR COUNTRY FROM THE VIEWPOINT OF SPECIAL POLICY CHALLENGES AND SPECIAL COMPETITIVE ADVANTAGES? 10:00am: Audience Participation Questions – Questions collected from the audience during the primary panel discussion and posed by the moderator at this time. 1. WHAT DOES THE PRIVATE SECTOR NEED FROM THE PUBLIC SECTOR? 2. WHAT SIGNIFICANT UNWARRANTED CONSTRAINTS COME FROM THE PUBLIC SECTOR? 3. WHAT DO YOU SEE AS THE BALANCED AND SUSTAINABLE FUTURE OF THE RESPECTIVE ENERGY SUBSECTORS? 4. WHAT FINANCING CONSTRAINTS ARE PRESENT? 12:00 noon: Audience Participation Questions – Questions collected from the audience during the second panel discussion will be posed by the moderator at this time.